Q4 2018 was marked by geopolitical disputes and policy changes that affected the global economy and had a significant impact on markets around the world. 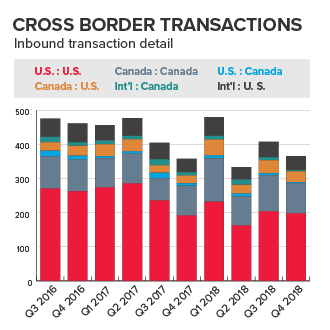 The quarter started out on a high note with the leaders of Mexico, the United States, and Canada agreeing to the framework for a new regional trade agreement. This positive sentiment was short-lived, with Brexit and U.S.–China trade negotiations heating up and driving continued uncertainty.  This and other headwinds reduced transaction volume by 10% between Q3 and Q4 of 2018, though we still saw a 2.2% increase on a year over year basis. 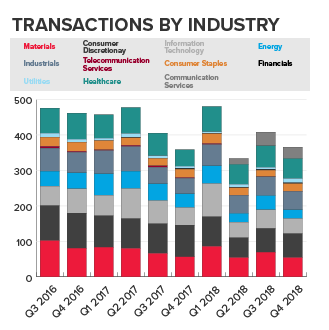 The utilities sector saw M&A activity flourish in the face of the uncertainty, with a significant increase in transaction volume during the quarter as disruptive new infrastructure and grid technologies continued to drive consolidation.